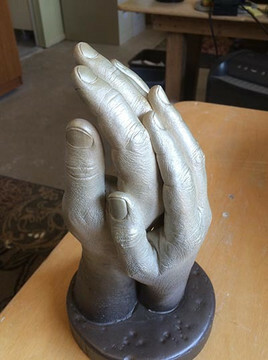 You too can now make a hard stone casting, with amazing detail, of up to two adult hands with our complete Adult Hand Casting Kit. Lots of fun and a terrific way to learn this fascinating art form. Once you learn, you can purchase the materials in bulk and save some money. The complete procedural video can be found below. It is well worth watching to ensure a great result. Replacement Alginate and LiquiStone available if you want to do a second casting. Very Popular Item for Valentines Day. Great Wedding Present. Please don't wait for the last minute to order.